Have you ever dreamed of a workshop in your backyard? Do we have one for you, a wonderful metal shop building that you can erect in a matter of days and with as few as three people? Our metal shop buildings come in several models from which to choose to fit your particular needs. These clear span metal shop buildings have 100% useable space with no beams or posts to get in your way. 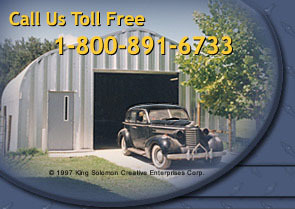 Your metal shop building is custom made, solid and secure. Each metal shop building comes with a rust-through warranty to give you peace of mind and years of maintenance-free service. Order your metal shop building today and make your dream come true.